Anyone who is unfamiliar with liveaboard diving may wonder what all the hype is about, however, those who have participated in these trips understand why people keep going back for more. Divers taking liveaboard diving trips board a boat in the beginning and stay on that boat for the duration of the trip. This allows everyone to travel further out into the water, while stopping to complete fabulous dives along the way. There is no need to turn back by a certain time to ensure that everyone arrives back at port for dinner or to sleep at their hotel. Instead, everyone enjoys the extra time on the boat under the nighttime stars. While there are many different places to participate in liveaboard diving trips, the Similan Islands are one of the best locations in the entire world. These nine islands, just off the coast of Thailand, are only accessible to divers via the Thailand liveaboard diving trips due to the area being a protected marine park. This exclusivity ensures that everyone has an extraordinary diving experience while viewing all the marine biodiversity that is available within that region. Hey there, just a quick note. 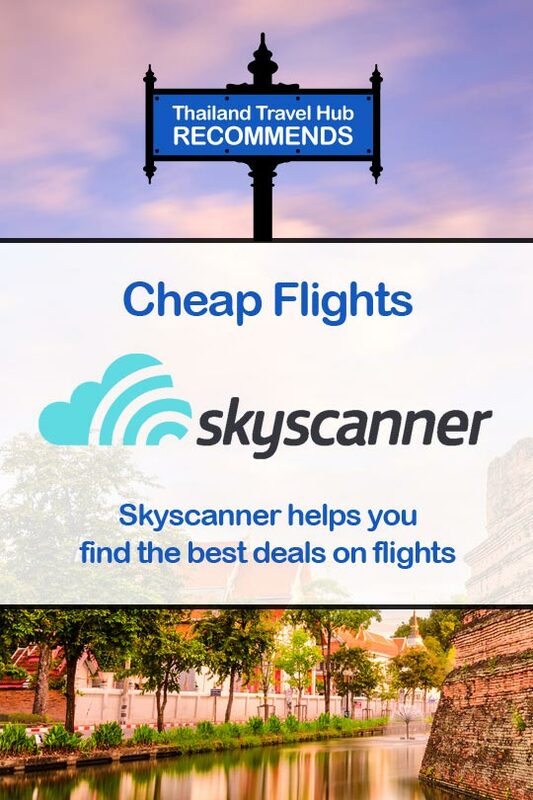 There are some affiliate links in this post, meaning, at no additional cost to you, we will receive a commission if you book or make a purchase through one our recommendation links. This has no impact on our content, we simply review and recommend helpful and useful things we love. Thank you for supporting our website in this way! The Manta Queen 5 is one of the best options for those divers who are on a budget. This boat goes out almost every week for their popular 3-night trips, and with a size of 23m, this Manta Queen can host up to 22 guests inside the twin bunk cabins. While you will spend quite a bit of time diving and snorkeling, you will also find yourself relaxing on the open roof top sundeck as you stare out into the wide-open sea. The amenities on this boat includes delicious buffet style meals, and you will find a dive staff of five along with six other crew members ready to assist you at any time during your trip. If you are certified, you will be able to utilize the Nitrox that is on board and everyone can rent their full diving equipment for a cost of 1200THB per trip. The Manta Queen 5 mainly leaves from Koh Bon Island during the months of October through May. 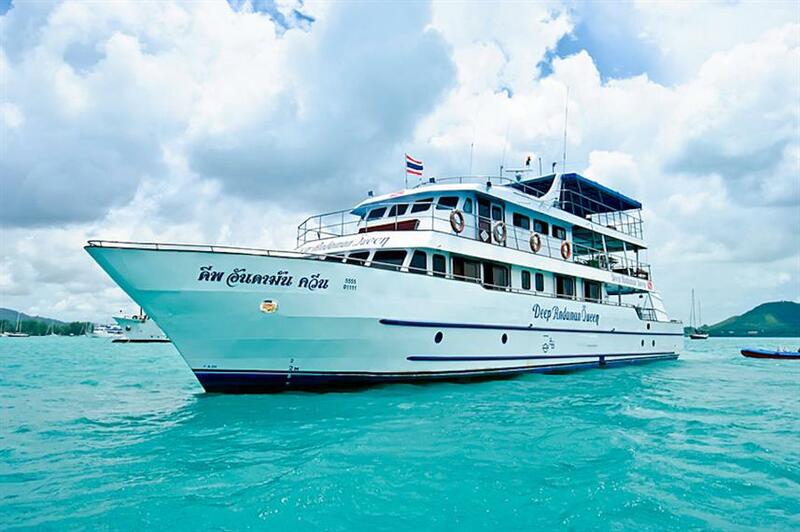 The Dolphin Queen offers 24m of fun to those who are looking for a budget Thailand liveaboard diving adventure. This boat goes out each week for a 4-night trip, although they also have special 7 or 8-night trips on occasion. The Dolphin Queen can host up to 22 guests within the 8 cabins, of which two are doubles, one is a twin, and three are quads. The delicious cuisine that is served is prepared fresh every day and breakfast is always made to order. When you are not in the water snorkeling and diving, you may find yourself relaxing on one of the hammocks out on the sundeck, but don’t forget to keep an eye out for the dolphins and whale sharks as you are laying there. Full diving gear is available to rent for this trip and Nitrox is available to those who are certified to use it. The Dolphin Queen leaves from Richelieu Rock during the months of October through May. 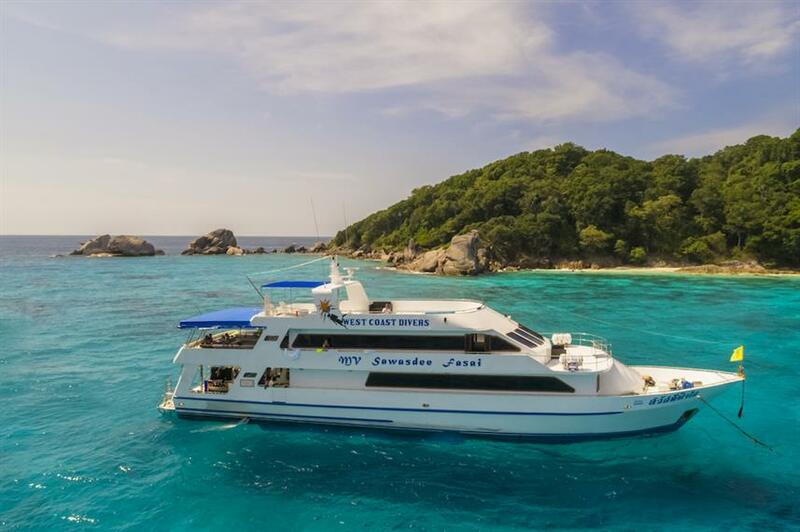 Up to 18 guests at a time can explore the waters of the Similan Islands, with Koh Bon Island and Richelieu Rock being the focus points for the 2 or 3-night trips on the Similan Explorer. There are 8 cabins, some twin bunk cabins and others double cabins, and each one has AC and windows looking out towards the sea. In between time in the water, you can relax in the lounging area or up on the sundeck as you keep a watchful eye out for dolphins and manta rays. Food is prepared throughout the day, so you will never find yourself hungry and the staff can always accommodate special dietary requirements. During the dives and snorkeling expeditions, your guides will be quite happy to search for the unique marine life that lives within the Andaman Sea including seahorses, nudibranchs, and pipefish. Snorkeling equipment is included with this trip and full diving gear can be rented directly on the boat. Nitrox is available as well to those who have been certified. 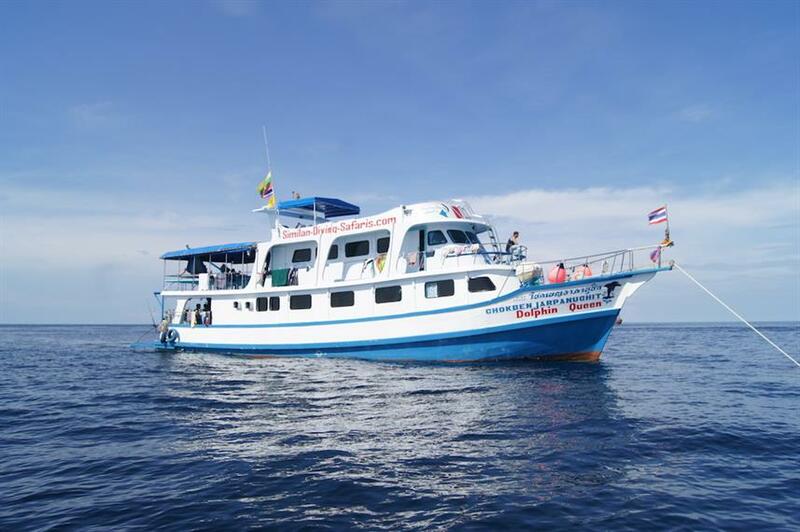 The Similan Explorer is the perfect option for those looking for a budget tour from the months of October through May. 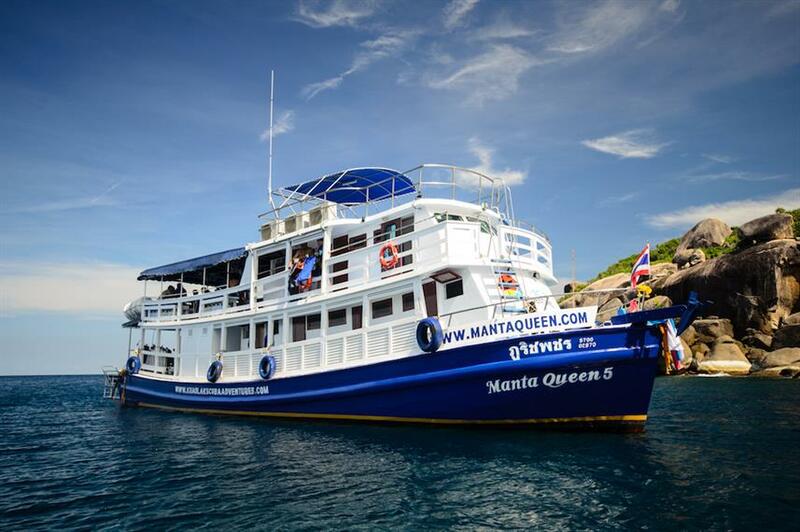 The Manta Queen 1 offers budget trips to up to 22 guests as they explore the Similan Islands including Koh Bon, Koh Tachai, and Richelieu Rock. There are 10 cabins that guests use at night or to relax in during the day, although you may prefer to spend your downtime laying on a mattress up on the sun deck. The Manta Queen 1 goes out on 4-night trips and the 5 people on the dive team will ensure that you have an amazing time as you dive with whale sharks, immerse yourself into the middle of a school of fish, and capture a glimpse of the reef sharks near Elephant Head Rock. These trips are available between the months of October and May and full diving equipment can be rented to 1600THB per trip. 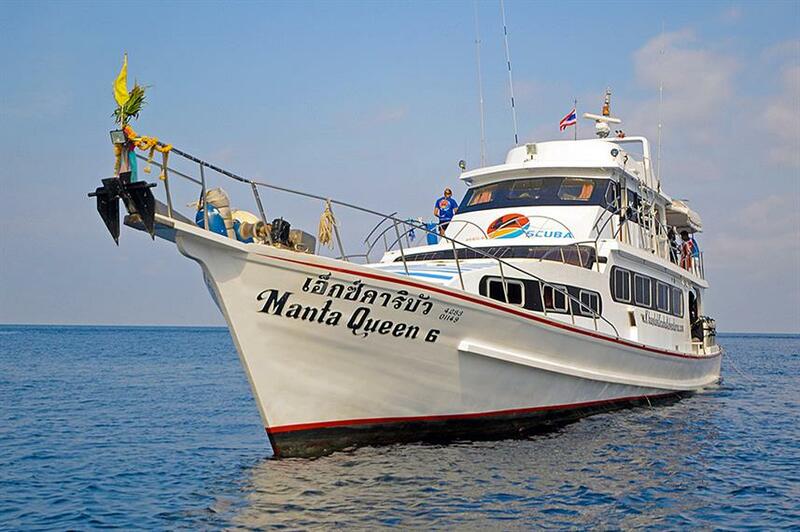 The Manta Queen 6 offers popular 4-night Thailand liveaboard diving tours within the Similan Islands with the focus being on Koh Bon, Koh Tachai, and the infamous Richelieu Rock. This 25m boat has plenty of room for up to 14 guests within the 7 twin cabins complete with air conditioning. There are 6 members of the boat crew and 4 people on the dive staff and their goal is to meet your needs throughout the entire trip. The onboard chef is always preparing fresh cuisine to serve buffet style, and when mealtime is over, snacks and fruit are readily available. When you are not diving or snorkeling, you may want to take a ride in the dinghy to one of the nearby beaches on the islands, so you can relax on the soft pure white sand. Full diving equipment is available for rent for 1600THB per trip and Nitrox is available for 150 THB per dive to those who are certified. 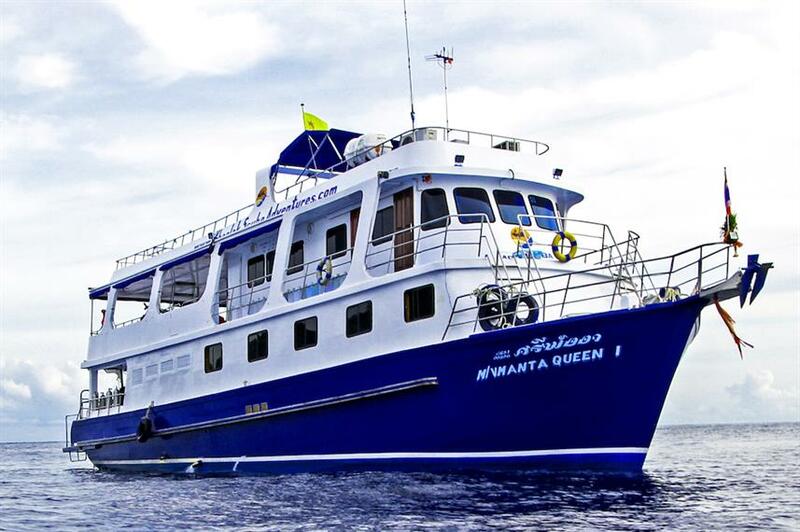 The Manta Queen 6 goes out on liveaboard diving in Similan Islands from October through May every year. 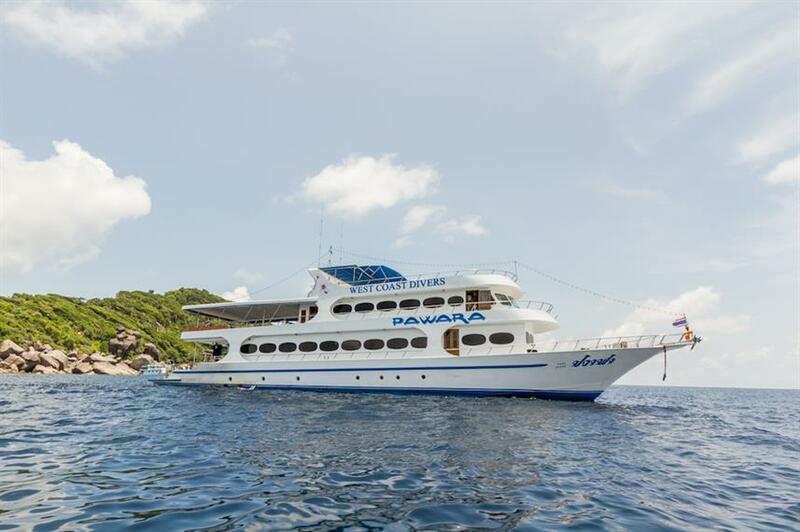 The Sawasdee Fasai is the sister ship of MV Pawara and she was custom built to ensure that every one of the up to 30 guests has an amazing time out on their Thailand liveaboard diving trip. 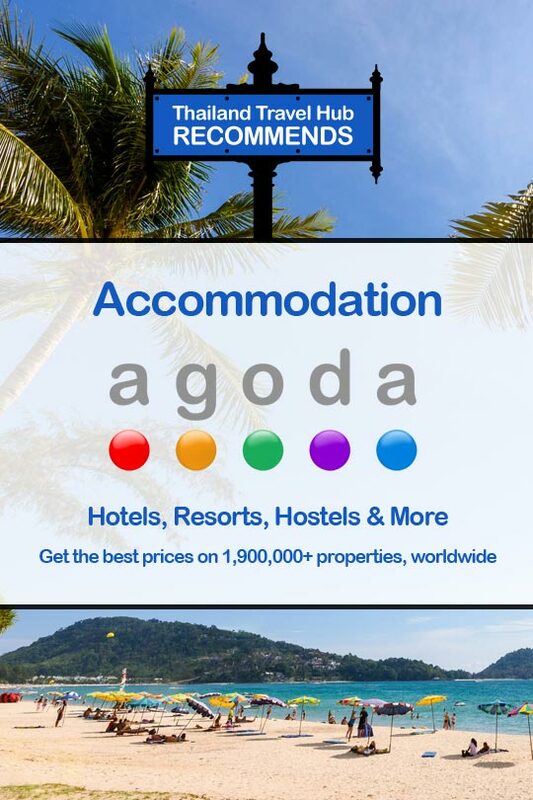 The guests’ accommodations include one of the 15 air-conditioned cabins. Some guests will have their own bathroom, while others will share. You will spend a good portion of your time out on the water as you dive and snorkel in some of the best areas of the Andaman Sea near the Similan Islands. During your downtime, you can choose to sit at the refreshment bar or in the outdoor or indoor lounge. However, most guests like yourself prefer to be outside on the massive sundeck as they look out towards the sea. The Sawasdee Fasai goes out for 4-night trips each week from the months of October through May. 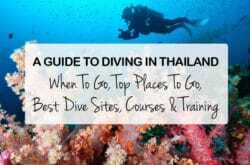 Full diving equipment is available for 500THB per day. 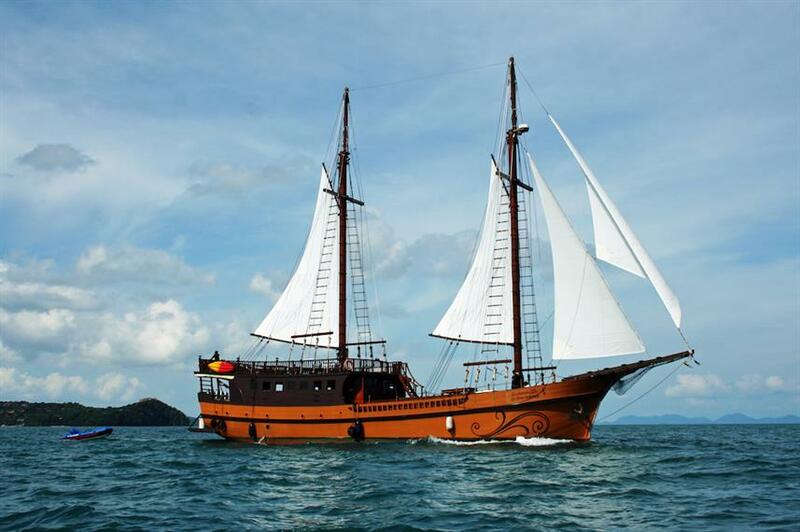 The Pawara is a 35m boat that ventures out for liveaboard tours for 4-night trips each week near the Similan Islands. 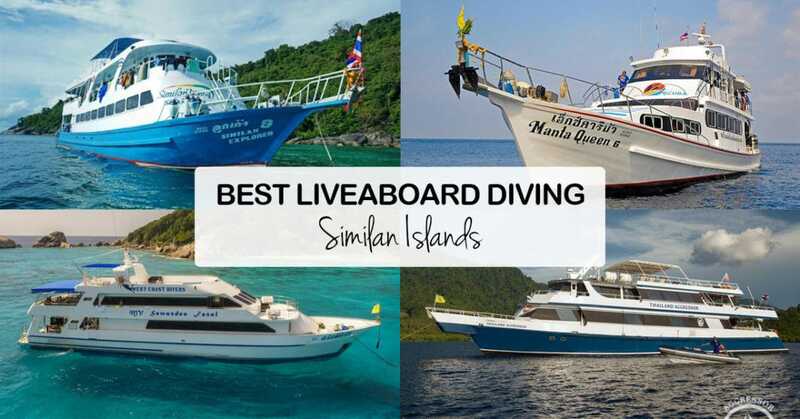 You can be one of the 24 divers on board as you see spectacular diving sites that include Koh Bon, Koh Tachai, and Richelieu Rock. While you are out in the water, you can expect to see manta rays, numerous types of sharks, dolphins, and brightly colored coral. Onboard, there are 12 cabins that are air conditioned, but you may spend most of your time on the sundeck. During your downtime, you can also utilize the entertainment room as you watch television, perform some karaoke, play a game, or simply read a book. The onboard chef will prepare delicious meals for you to enjoy and snacks are always available. Pawara goes out for liveaboard diving trips during the months of October through May and you can always rent your full diving equipment for 500THB per day. 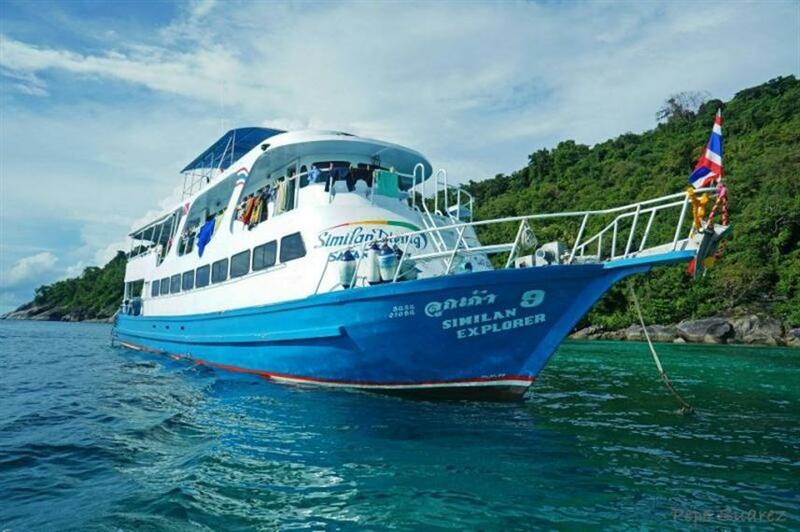 The Deep Andaman Queen takes up to 21 divers out into the Andaman Sea near the Similan Islands to experience diving at its best. There are 12 cabins on board, with 9 of them being en-suite cabins. All the cabins have air conditioning, so you will be able to choose the cabin that fits both your needs and your current budget. As you are participating in dives or doing some snorkeling, you will be using a large diving platform. There is an exit platform that is completely separate from the entrance one, which gives you plenty of room for yourself and your gear, plus you will never need to wait your turn. The onboard crew is quite attentive and will meet all your needs and desires during your time on the boat. The international cuisine that the chef prepares will keep you well-fed for each one of your adventures during your trip. The Deep Andaman Queen only goes out for liveaboard diving in Similan Islands during the months of October through May due to the weather in that region. Full diving equipment can be rented on this boat for 700THB per day, but that does exclude a computer. Nitrox is also available for purchase by those who have completed the certification process. The most popular liveaboard diving trips on the Giamani are the 6-night ones, but they do also offer trips for fewer nights. 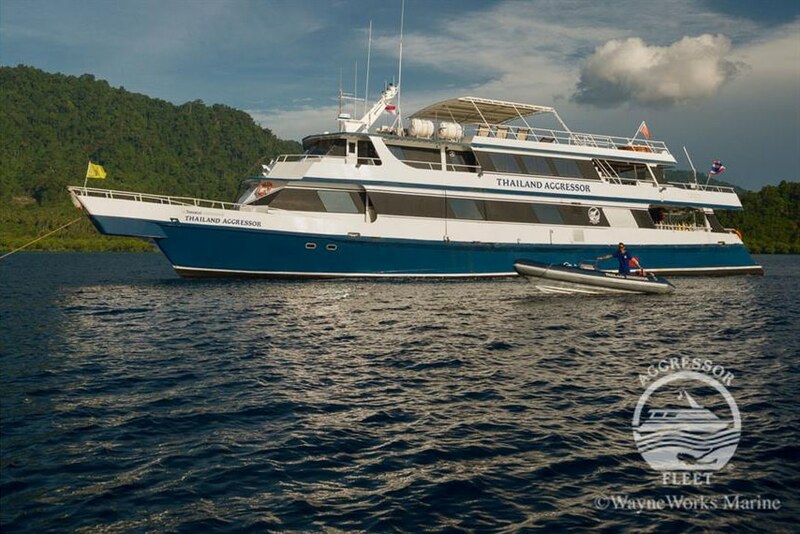 You will be given personalized service on this boat, because there are only up to 10 guests per trip. There are 5 cabins and the same number of bathrooms, so you will find that you always have plenty of room no matter where you are. When you are not out in the water diving or snorkeling, you will find yourself relaxing in the lounge or up on the sundeck. For those times when you are diving, you will enjoy the spacious dive deck, especially the table for rinsing off all your cameras. 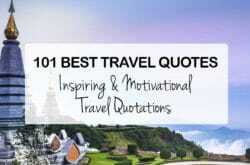 As mentioned, the crew is very attentive, as is the chef who will serve all your meals buffet style on the main deck. The Giamani ventures out into the Andaman Sea during the months of October through May and each trip is guaranteed to be memorable in many ways. Full diving equipment can be rented for 800THB per day and guests who have been certified to use Nitrox will find it readily available for purchase as well. The luxurious DiveRACE Class E is 34.5m in length, which is perfect for the up to 20 divers who are on board. This boat offers the ultimate in safety and comfort, which includes the 10 air-conditioned cabins. There are 6 twin or double cabins and each of those has their own bathroom and private balcony with extraordinary views. The other 4 cabins are quads with their own bathrooms, and those are perfect for small groups or families traveling together. When you are not out diving or snorkeling, you may find yourself enjoying the quiet of the lounge, having a massage, or relaxing with a drink in hand up on the large sundeck. 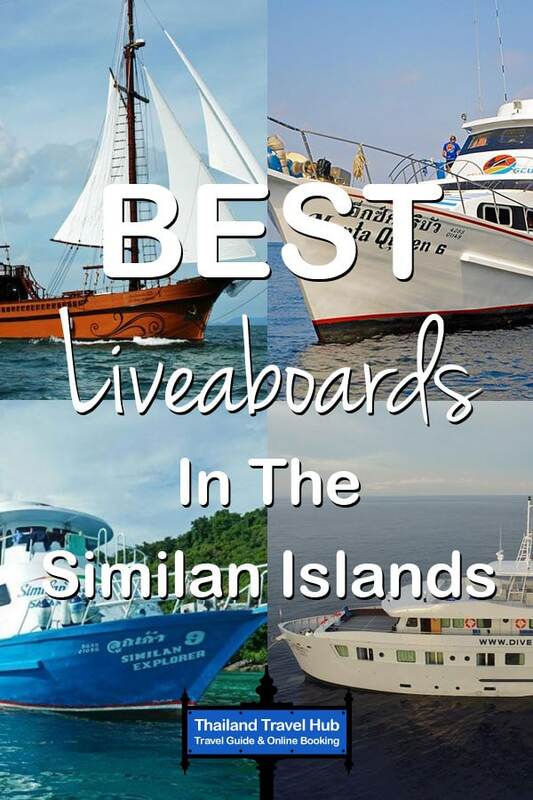 There are fifteen crew members on board to ensure that you have a phenomenal time during your liveaboard diving trip amongst the Similan Islands. 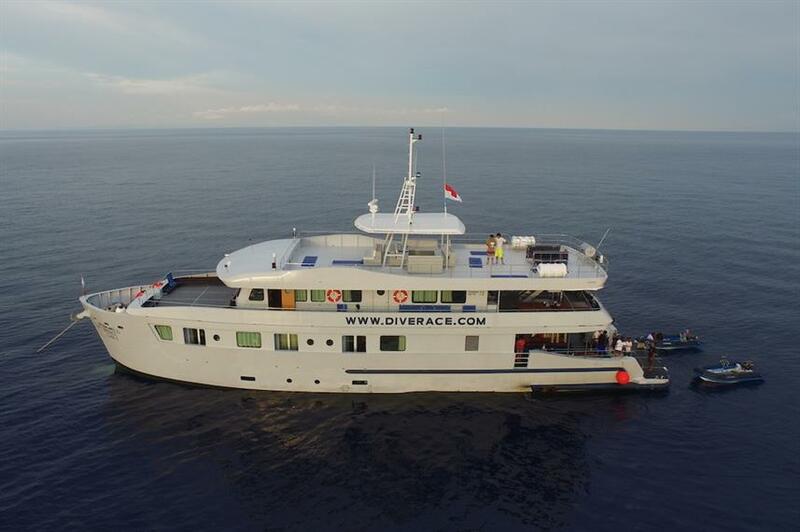 The DiveRACE Class E goes out for 4 or 5-night trips during the months of October through May. Full diving equipment is available to rent for 700THB per day and Nitrox refills are available to those who have been certified to use them. The Diva Andaman is a beauty at 35m and she moves seamlessly through the water of the Andaman Sea from the months of October through May. 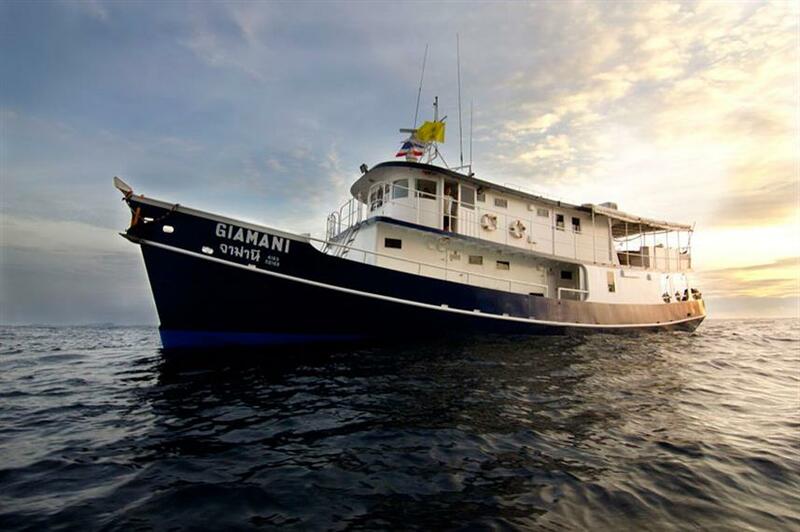 This boat goes out on 6-night liveaboard diving trips each week and up to 14 divers can be on board for each adventure. There are 7 luxury cabins on board and each one has their own bathroom. The crew is very attentive, and their goal is to cater to your every need. There is always 1 dive crew member for every 4 guests, so everyone gets the amount of attention that they require. You will thoroughly enjoy each one of your dives and you will never need to do the clean up and packing away of equipment at the end of each one, because the crew does it all. That means that you can begin your relaxing a little sooner, which is perfect for all those extras that are on board the Diva Andaman. You might start your downtime with a traditional Thai massage before continuing with a cocktail up on the sundeck. The chef prepares a continental breakfast each morning and lunch is always served buffet style. At dinnertime, you will be seated under the stars and served a three-course meal that will bring a perfect ending to your day. Full diving gear is included with a trip on the Diva Andaman and Nitrox is available to anyone that has received certification. The Thailand Aggressor is a 35m boat that brings luxury to the Andaman Sea during the months of October through May. The extraordinary crew of 8 will meet the needs of each of the guests on board for the 7-night trip, which is easy since there are only up to 18 guests allowed per trip. There are 8 cabins on the Thailand Aggressor and each one has a private bathroom, television, and air conditioning. When you are out on the water, you will see sharks, manta rays, and a plethora of other marine life as you are diving and snorkeling. There are five dives each day, so your schedule is going to be packed for most of your trip. However, during your downtime, you will enjoy the cuisine that the chef prepares for each meal, as well as spending time in the lounge. Of course, your favorite part of this boat may be the sundeck with its jacuzzi and bar service. Full diving equipment can be rented on the boat and Nitrox is available to those who have been certified. 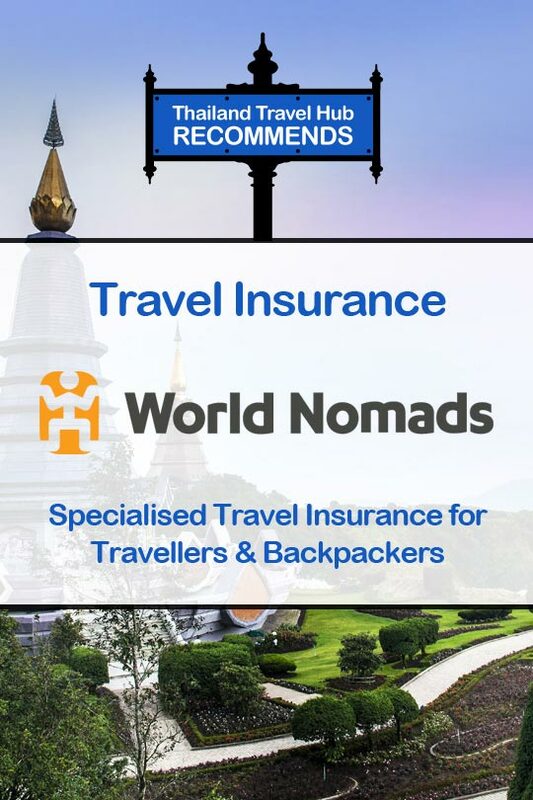 What’s Included: VAT, Accommodation, Complimentary toiletries, Transfers/Pickups from airport, Tanks, Weights, Belts, Dive master services, All meals, Alcoholic beverages.